Two out of the three multi utility vehicles scheduled this year – Maruti Ertiga and Nissan Evalia, are in and the third Chevrolet Enjoy is highly awaited. With the launch of these the segment in itself will also bulge and it is expected that in the absence of sky rocketing growth, the increase in share of one of these cars will be at the expense of the other. The other players in this segment including Toyota Innova, Mahindra Xylo and Chevrolet Tavera are able to somehow maintain their share in the market. Though already Maruti Ertiga has eaten away a larger share and recently Mahindra Quanto has transgressed into the segment to grab some of the buyers towards it. As per the latest buzz about the Chevrolet Enjoy MPV, its trial production has begun at the Gujarat plant and it is expected that the Enjoy launch follows soon after the Chevrolet Sail U-VA launch on November 2. Sources confirmed that the Enjoy launch will be in December this year. Initially, only 40 units per day production is going on at the plant on a trial basis and the plant will be operating at full capacity once the car is launched in India in December. Recently, the car maker has also launched the facelift model of the Chevrolet Spark small car eyeing the Maruti Alto 800 launch. It is said that the Alto 800 is getting huge response in India and it is soon to break the record of sales. Though the Spark is priced higher than the Alto 800 but segment wise these are siblings and thus there is competition among them. The new Spark launch has certainly offered the customers the choice of going for a slightly up market car with new features than the mundane Alto 800. 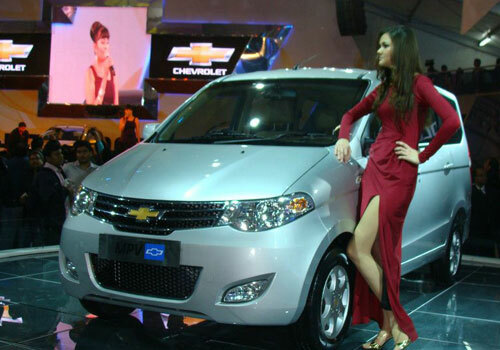 The unveiled Chevrolet Enjoy pictures appear eye-catchy. Internal look of the vehicle is too better. But there are many of rivals already available in market and its success will depend on price. The company have to play price game for Enjoy to make it a hit model in this transition time.